Cheerios has been a household name for years. So, when they contacted us about creating a fan-driven online photo mosaic, we were more than thrilled! 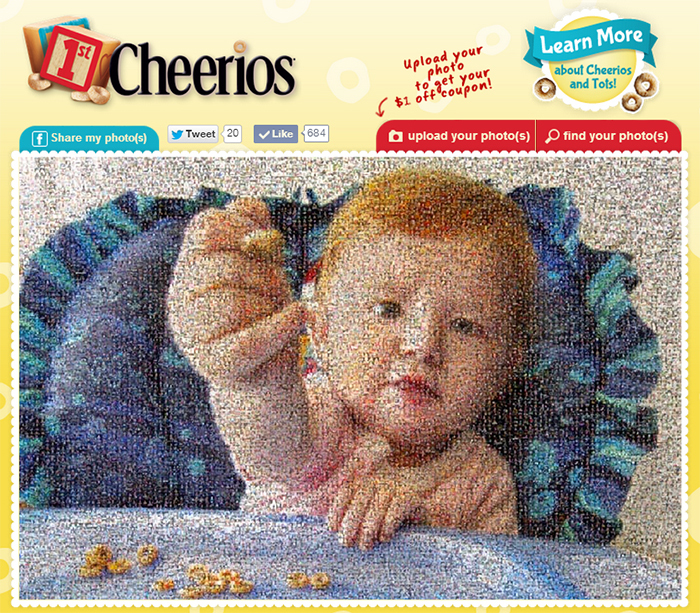 Using a modified version of our interactive mosaic platform*, Cheerios asks parents across Canada to share photos of that special moment when their child enjoys their “First Cheerios.” Parents can upload photos directly from their Facebook album or local PC in a simple Facebook tab. Not only are photos featured in the mosaic, but the user also receives a $1.00 off coupon after their submission is complete. Photos are shared through Facebook by the click of a button. Our dynamic “pop-out” animation showcases individual photos at random, bringing them out of the photo mosaic for a detailed view with their photo caption. This entry was posted in Mosaics, Online Interactive Photo Mosaics, Photo Mosaics and tagged cheerios, interactive, mosaics, photo mosaic, photo mosaics, photomosaic, photomosaics on May 6, 2014 by Robert DeCarolis.